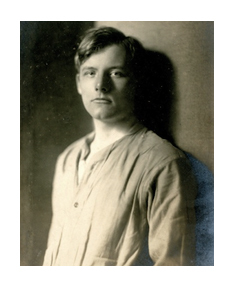 Geoffrey Dearmer (1893-1996) is best known as a First World War poet; he was born within three days of Wilfred Owen, and outlived him by seventy-eight years. His poems were published to great acclaim in 1918 (the date of this attached photograph), and republished as A Pilgrim’s Song in 1993, to commemorate his centenary. In 1933 he published Saint on Holiday which is a satire about a near-future Britain which is run by ministries which were actually designed to benefit citizens. In They Chose to be Birds (1935) a preacher is duped into “becoming” a bird, and, as John Clute in the Encyclopedia of Science Fiction puts it, “as such learns some Wellsian lessons about the true nature of the world”. Geoffrey Dearmer (1893–1996) was born in London, the son of Percy Dearmer, a Church of England clergyman and liturgist, and of Mabel Pritchard White, a children’s writer and illustrator. His mother wrote about the childhood of Geoffrey and his brother Christopher in her book The Noisy Years (1902). Geoffrey became a day boy at Westminster School, and went up to Christ Church Oxford to read English in 1912. He was not much given to study, however, and left in spring 1914, without taking a degree. He enlisted in the army a few months later; see his war experiences. Dearmer stayed in the army until 1920. He was then in India for a year, tutoring the younger son of Lord Lytton. When he returned to England, he wrote, and he worked as a play-reader for a theatrical impresario. He was responsible for getting R.C. Sherriff’s Journey’s End its first West End production (with Laurence Olivier as the lead): it became the best-known of all First World War plays in Britain. From 1936 to 1950 he worked in the Lord Chamberlain’s office as a play censor, although he said later that he could not remember ever banning a play. He also worked for the BBC; from 1939 to 1959 he was literary editor of Children’s Hour on radio (which I well remember listening to during his time there). He married in 1936; he and his wife had one daughter. His wife died in 1980, and Dearmer moved in 1980 into sheltered accommodation in Birchington, Kent. Laurence Cotterell, a publisher, and author of the obituary of Dearmer in The Independent) raised the money for republishing his poetry in 1993, on the occasion of Dearmer’s hundredth birthday. It was launched at a party at the Imperial War Museum in London. Dearmer died at Birchington on 1996, and his ashes were scattered near his father’s old church in Primrose Hill, London. The Poetry Society now offers an annual prize for poetry, called The Geoffrey Dearmer Prize. My information comes from Mark Bostridge’s entry in the Oxford Dictionary of National Biography.